Great news for lovers of irony and tiny sandwiches: Reservations for the 28th White Castle Valentine’s Day dinner are officially open. For the readers who fall into that category, you can snag your reservation through OpenTable.com, the OpenTable app, or by calling the regional White Castle office nearest you. Go on, you lovebirds, get to it, we know you’re excited. Don’t worry about the rest of us, we’ll carry on alone. Now then. 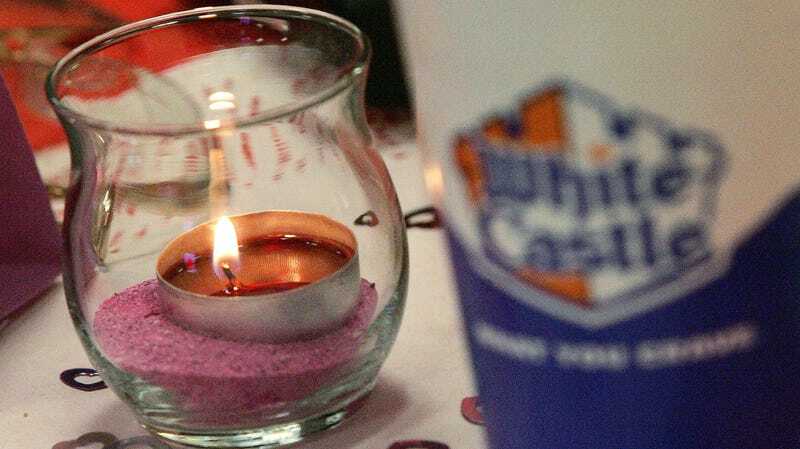 For those unfamiliar with this unusual promotion, White Castle has been at this for more than a quarter-century, doing away with the typical quick-service format and instead having hosts seat guests for table service of the typical White Castle delicacies and plenty of romantical decorations (see above). Seatings will begin at 4 p.m. on the 14th of February at select locations and continue through 9 p.m.; due to popular demand (yes, really), at a limited number of locations, the service will also be offered on the 15th. If you’re at all intrigued, get on it in a hurry, because 30,000 people—we repeat, 30,000 people—did Valentine’s Day at the Castle last year. Two Las Vegas locations have also joined the fray for the first time, so you can go get some sliders and then hit the Ferris wheel bar if you’re so inclined. One last thing: for the first time, White Castle will also offer a delivery option. In a press release, the chain said more information would be coming in early February, but expect to be able to get a “Love Castle Crave Case” delivered to your door if you’re so inclined. Why anyone would want to do Valentine’s Day White Castle-style without actually experiencing the novelty of the thing, we don’t know, but hey, the option’s there.